My do I have a pretty group of friends! This past weekend was the annual Suszette McKay Fundraiser. The organization raises money for Pulmonary Fibrosis. 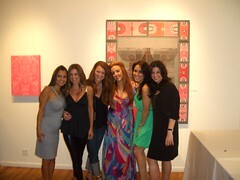 It was hosted in Chicago at the Linda Warren Gallery and I had a great time! I walked away with a brand new Wii (courtesy of my friend El Diable Guapo). I serve on the board of this small, charitable foundation and, though I am not sure how much we raised so far this year, I believe it was a record year. Our silent auction killed.